From the solution, it is clear that $x_t$ cannot become negative. However, it is not so clear from the SDE. In fact, if I do simulations using the SDE, x very frequently becomes negative for certain parameter combinations. The reason SDE may seem to allow a negative value of x is because dW can be a large negative number, and thus can move x from positive to negative values. If that's the confusion, that is justified only in discrete case. Do a thought experiment. Imagine the transition point of x from positive to negative in discrete case. Now, to move closer to the continuous case, you can decrease dt and imagine x as going from positive to zero first, and then to negative. But your SDE states that dx = x multiplied by something. So when x->0, dx also ->0. This should help you understand that the negative values are only coming from discretization of an otherwise continuous process. Now, if you fix your formulas in the simulation and make it E3= E2+ D2*E2 (instead of D2+ D2*E2 which you used), you can still get negative values if sigma is really large and dt is not small enough. 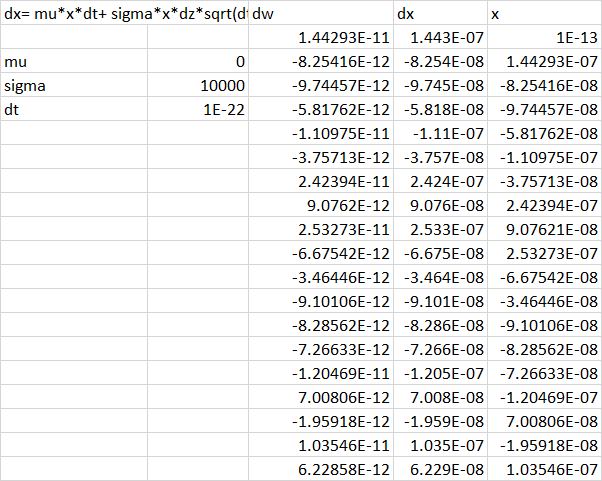 But try changing dt relative to sigma and you will find it harder to get negative values. Moreover, excel might have a limit of how small you can go. Not the answer you're looking for? Browse other questions tagged stochastic-processes stochastic-calculus brownian-motion simulations or ask your own question.